Chris Jochnick is a global land rights expert and social entrepreneur with decades of experience in international development. 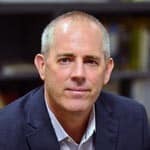 Chris joined Landesa as CEO in August 2015 after leading Oxfam America’s work on business and development including shareholder engagement, value chain assessments, and collaborative advocacy initiatives, such as the successful “Behind the Brands” campaign. Jochnick is the co-founder and former director of two pioneering non-profit organizations: Center for Economic and Social Rights and the Ecuador-based Centros De Derechos Economicos y Sociales. Jochnick spent seven years working in Latin America, devoting much of that time to addressing threats to indigenous peoples’ land rights. Prior to Oxfam, Jochnick worked as a corporate attorney with the Wall Street law firm Paul, Weiss, Rifkind, Wharton and Garrison, on corporate governance and social responsibility issues. Jochnick is a graduate of Harvard Law School and a former fellow of the MacArthur Foundation and Echoing Green. He teaches a course on business and human rights at Harvard Law School. The sharing economy isn't built on apps or smartphones. Its foundation is something far less high tech: paper. Specifically, legal papers related to property such as deeds, titles, leases and the institutions that uphold them. But those documents, and the rights that go with them, are far too scarce for the poor. How some countries are transforming their property rights and land tenure systems, and why the development community should take notice.